This is not a reference to vehicles speeding through the village, despite the antics of some of those following the route of the North Coast 500! But it is not often that a botanist based here in the far north-west can log over 200 species of plants in one day. So I hope a small celebration may be forgiven. 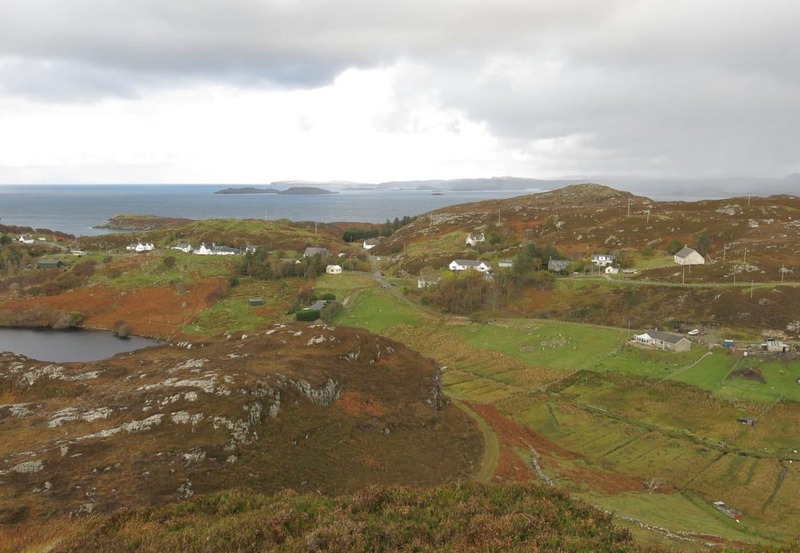 The Botanical Society of Britain and Ireland wants an up-date of Assynt records for their forthcoming Atlas 2020, since most of them date from the last century/millennium, i.e. before 2000. I have therefore mapped out a series of target one-kilometre squares across the parish where I shall record the plants. One of these is NC1232, centred on Drumbeg village. Saturday 23rd September 2017 dawned bright, for a welcome change. So I set out on foot at 0920 hours, west from Nedd along the road to Drumbeg, entering the target square just down the hill from the cattle grid at the Bealach a’Gaoithe (windy pass). The roadside, ditches and adjacent moorland provided a good start to my plants list and I then contoured round the hill to the wooded northern bank of Loch Ruighean an Aitinn (loch of the sheiling of the junipers). This is otherwise known as the Lily Loch, well-deserved subject of innumerable photographs by visitors, especially earlier in the summer, when it is covered with flowering white water-lilies Nymphaea alba. Just over an hour later I sat down by the loch for a cup of coffee, totted up the list, and found to my surprise that I had already logged over a hundred species. Wet ground, with small flowing burns, had added plants such as black bog-rush Schoenus nigricans, common butterwort Pinguicula vulgaris, marsh marigold Caltha palustris and tufted forget-me-not Myosotis laxa. At the edge of the loch itself, I had found two of the ‘specials’ which warrant a precise grid reference, marsh cinquefoil Comarum palustre and least bur-reed Sparganium natans. 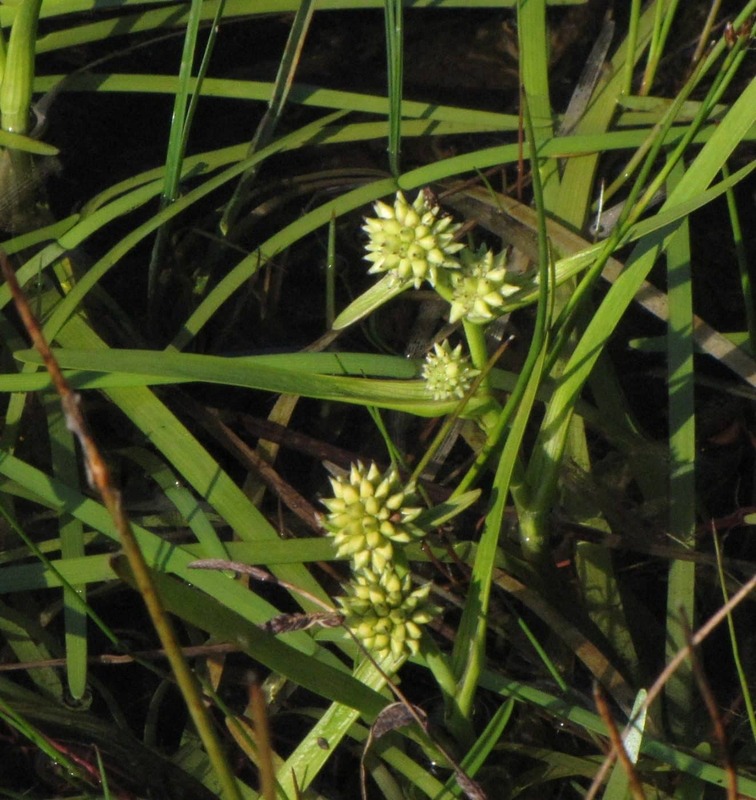 Although few of these were still in flower, their foliage was distinctive enough for me to identify them. 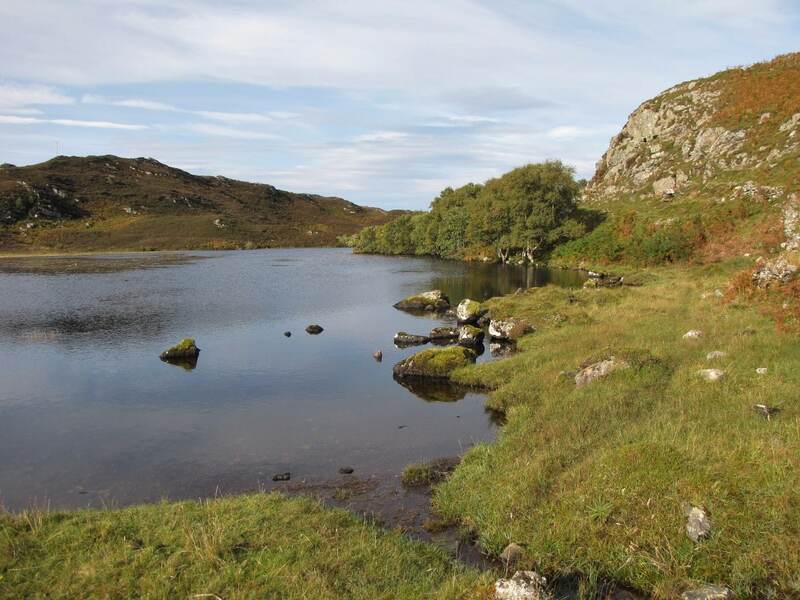 I then hiked through dense heather along the south-west side of the Lily Loch to a back gate into the grounds of Drumbeg House, where I made my presence known to the owners, Eddie and Anne Strachan. They were showing round some potential purchasers, who may have thought that the bearded figure who suddenly appeared with a clipboard, asking about ‘weeds’, was a resident eccentric. After they had left, I was entertained to more coffee and home baking; Eddie then took me round parts of the grounds I had not previously visited. Amongst more workaday species was single clump of Japanese knotweed Fallopia japonica at the loch-side, which Eddie said, interestingly, had not moved, i.e. increased, ‘in years’. This is usually the case in Assynt, despite the opprobrium this alien species incurs further south. Nearby was some water figwort Scrophularia auriculata, a British native but rare escape from cultivation this far north; it was burgeoning elsewhere in the garden. The old mixed plantations behind the house yielded a fungus new to Assynt, stump puffball Lycoperdon pyriforme (see Troops of puffballs at Drumbeg), as well as a seasonal fly agaric Amanita muscaria and both frogs and toads. I then made my way to a quiet spot overlooking Drumbeg’s offshore islands for lunch. A quick sortie afterwards along the ridge above the village, which is a conspicuous mafic dyke, did not yield anything new, so I dropped down to the main street and started focussing on further garden weeds and escapes, the bread-and-butter of botanising in ‘built-up’ areas. The first noted was one of Drumbeg’s flourishing population of bird-sown bushes of the Himalayan cotoneaster Cotoneaster simonsii. I then called on Wendy Glover at Drumbeg Shop and asked permission to have a look at her small garden up the rock-face behind the shop, which she has planted up with a great variety of ferns, perennials and shrubs. 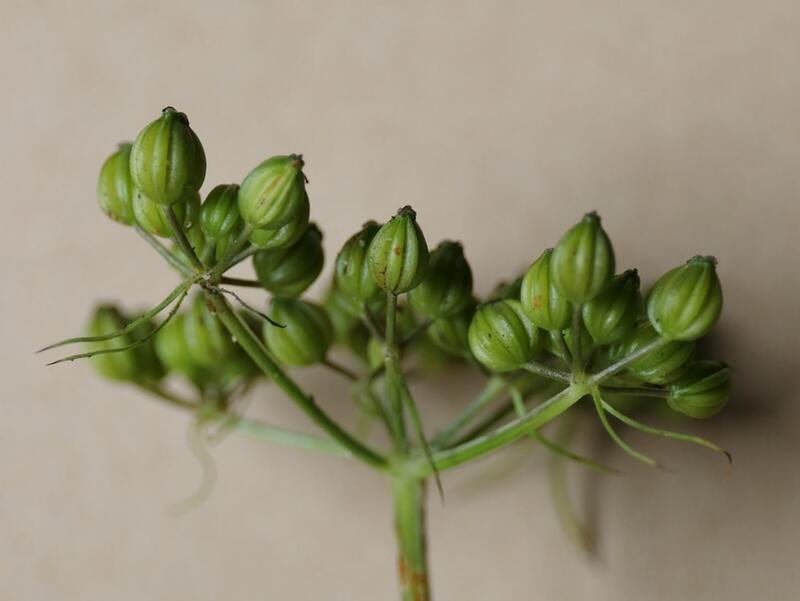 This is where I struck gold, with a plant of fool’s parsley Aethusa cynapium, a distinctive umbellifer with ribbed fruits in tight clumps trailing whiskery bracts (see photographs by David Haines). There is no previous record of this annual from West Sutherland, although it is extremely widespread further south. It must have been introduced, inadvertently, in soil or compost and, although probably a short-lived addition to the local flora, was worth recording, to show how far such species can get from their heartlands. Another discovery was wood avens Geum urbanum, which is very scarce in the north-west of Scotland. These and other finds were celebrated over a timely cup of tea with Wendy, in warm sunshine on a bench in front of the shop. Local knowledge allowed me to add two other local rarities to the list, a single clump of holly fern Polystichum lonchitis which grows in the wall outside the former church near the crossroads and ivy-leaved toadflax Cymbalaria muralis on the wall of the former post office. I then went off down the Drumbeg peat road, to look for more aquatics at the eastern end of Loch Drumbeg, and then pursued it up the hill to the edge of the square to look for some ‘missing’ moorland species. I added creeping willow Salix repens and also, just inside the grid line, Nordic bladderwort Utricularia stygia, in the burn out of Loch Poll a’Mhuic (loch of the hollow of the pig). Returning to the main street, I bumped into Nancy Millar, who kindly allowed me to add a few more species she had not planted from odd corners of her well-tended Schoolhouse garden. These included musk Mimulus moschatus, shining crane’s-bill Geranium lucidum and common hemp-nettle Galeopsis tetrahit, the last now a rare species of cultivated ground in Assynt. I then plodded happily, but slightly wearily, home after nearly eight hours in the field (including several breaks for refreshments and chat). My score for the day was 205 species, about a quarter of the total for Assynt as a whole. Some 175 of these were genuine ‘natives’, and the other 30 garden escapes, accidental imports and weeds of cultivation. Quite a number of so-called ‘natives’ are in fact archaeophytes, plants associated with human activities since at least Medieval times, but which may have been introduced to these islands as long ago as the Neolithic. So, species such as Himalayan cotoneaster are just the most recent examples of a diversification of the local flora that has been going on for at least 5,000 years; all worth noting for those that follow us.